Proponents claim that supplemental papaya enzymes offers several health benefits, from aiding in weight loss to reducing symptoms of digestive discomfort and acid reflux. 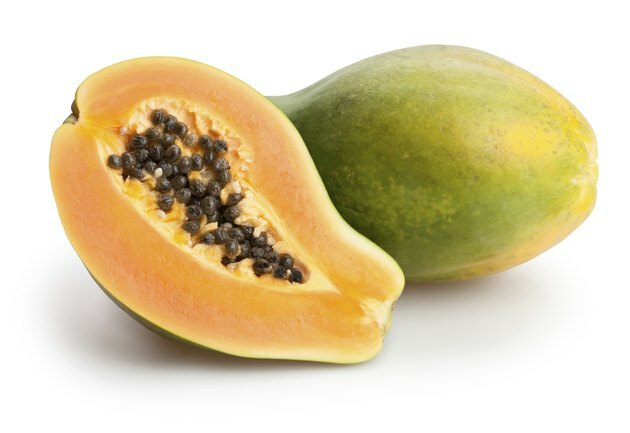 Since many women become concerned about pregnancy weight gain, and almost all pregnant women experience heartburn during pregnancy, some claim that papaya enzymes can benefit pregnant women. Unfortunately, there's no proof that they have any effect whatsoever. There are a few common concerns that many pregnant women share, explain Heidi Murkoff and Sharon Mazel in their book "What To Expect When You're Expecting." One of these is digestive upset, including acid reflux. Your cardiac sphincter, which normally keeps stomach acid in the stomach, becomes loose during pregnancy, which causes frequent heartburn in many pregnant women. Heartburn is exacerbated by your growing baby, which puts pressure on your stomach and increases the likelihood of acid reflux. Some manufacturers of papaya enzyme claim that enzyme supplements can help reduce acid stomach frequency and intensity, but there's no scientific evidence to support this claim. While the human body relies on a great variety of enzymes that participate in various chemical reactions, it isn't designed to use enzymes from plant sources, such as papaya. Furthermore, papaya enzymes can't survive the acidic interior of the stomach. Drs. Reginald Garrett and Charles Grisham, in their book "Biochemistry," explain that enzymes are very sensitive to acid and only those meant to operate in the stomach can survive its high acidity level. Other enzymes are simply destroyed and digested. Another common pregnancy concern for which women sometimes turn to papaya enzyme supplements is excess pregnancy weight gain. It's worth remembering that most women need to gain weight during pregnancy. Drs. Michael Roizen and Mehmet Oz, in their book "You: Having A Baby," explain that for women of normal pre-pregnancy body composition, a weight gain of 25 to 35 pounds is healthy. If you're gaining more than that, you should talk to your obstetrician prior to attempting to slow your weight gain or lose weight. In addition to the fact that most obstetricians don't recommend attempting to lose weight during pregnancy, papaya enzymes aren't effective weight loss aids. This is because enzymes are very reaction-specific, meaning that enzymes meant to digest starch can't digest protein, and enzymes meant to help produce energy can't participate in digestion. Papaya enzymes are protein-digesting, so they have no ability whatsoever to affect the body's fat metabolism. As such, even if you have your doctor's permission to try to lose weight during pregnancy, papaya enzymes can't help you do it.